You are currently browsing the tag archive for the ‘night’ tag. 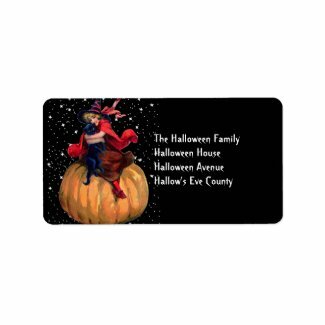 First Night Design | Halloween: The Final Frontier card #GCU #Sold! This cute illustration of a young witch (surely an innocent apprentice! 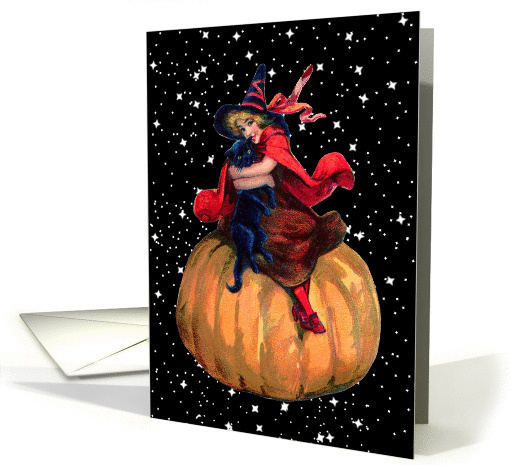 ), with her cat and pumpkin carriage, takes us back to the early 20th century when greeting card illustration was highly inventive and extremely popular. I have given her a new lease of life with a starry night background. “A Night at the Palace” Postcard by Sarah Vernon | Redbubble #Sold! I’m delighted to have sold a postcard of this image. Featured in The Group-Gallery of Art & Photography 22 April 2013. / Night. An abandoned palace. The middle of nowhere. Two ghostly figures. Now let your imagination run riot. 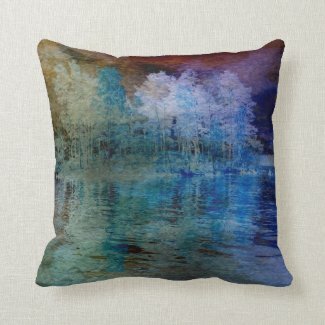 / Created in Photoshop with an interior from Wikimedia Commons, my own backgrounds and textures, and a clock from The Graphics Fairy • Buy this artwork on home decor, stationery, bags, and more. 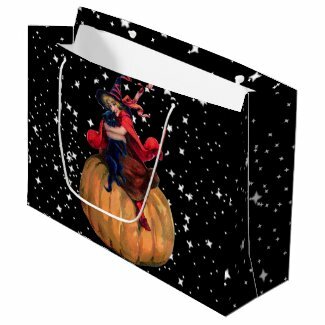 Zazzle tells me that now is the time to promote my products for Halloween. Since I almost never do this with calendar dates in time to make a difference to my sales, I’m continuing with the theme for today’s post. Look away now if you can live without 31st October! 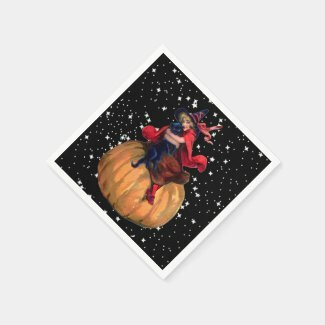 I selected the witch from a vintage image from The Graphics Fairy and then created a black background with stars. I’m rather fond of the result though I say it myself as shouldn’t. ACT I SCENE I A desert place. First Witch Where the place? Second Witch Upon the heath. Third Witch There to meet with Macbeth. First Witch I come, graymalkin! My current obsession with the sea and the coast continues with Night Landings. The original photograph is by Tim Mossholder at Unsplash and I have blended it with textures from 2 Lil’ Owls – 2LO Haunting 14 and 2LO Haunting 23. First Night Design | And Don’t Forget the Garlic! And Don’t Forget the Garlic! © Sarah Vernon from Redbubble. I have to confess to an unwavering passion for narrow streets. The temptation to go exploring and, inevitably, to get hopelessly lost, is overpowering. This type of street is often laid with cobblestones and not so easy for me this century since wheelchairs do not react kindly to such surfaces and juddering progress is rather painful on my decrepit old body. The original photograph was charming, if a little on the dark side. It was this darkness that I decided to make a virtue. The title is tongue-in-cheek but the resulting image does look rather like a street that would lead to Roman Polanski’s vampires in The Fearless Vampire Killers, or any vampire film come to that! Here’s an elephant design in place of a new computer! Take care and keep laughing, just as I’m trying to do! ‘Another elephant?’ I hear you cry. Or even, ‘Yet another elephant?’ Yes, yet another elephant but very different from the last. One day soon, when poaching, trafficking and killing for pleasure have been eradicated from the planet and the herds are increasing, I hope we’ll be saying the same thing with delighted relief. This magnificent creature comes originally from Wikimedia, that great repository of public domain images. You might imagine that I added a layer of black in Photoshop to create the effect, this is not so. I duplicated the elephant to the power of four and used several of my backgrounds and textures. By playing around with blending modes, I was able to create the effect of an elephant coming out of the darkness. I just might do something with the baby elephant next! This is a digital collage from 2012 in which I used a vintage theatre poster for the musical comedy The Earl and the Girl as my starting point and layered it with several pieces of ephemera in my theatre collection, including a black & white postcard of the actor-manager Sir Seymour Hicks. 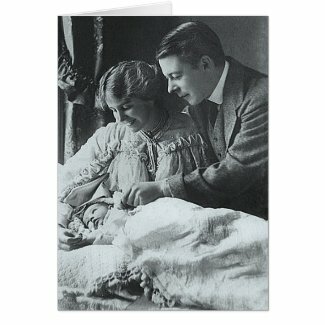 The above is not the postcard I used but another one for sale at my First Night Vintage store on Zazzle. Why? Because I don’t seem to have uploaded the other one for sale! The Earl and the Girl was produced by William Greet and first staged in 1903 at the Adelphi Theatre, London, before transferring to the Lyric Theatre in 1904. The show was also produced on Broadway in 1905 with Eddie Foy in the lead. The book was by Hicks, with music by Ivan Caryll and lyrics by Percy Greenbank. Ok, so a skeleton is not a scarecrow, as mentioned in the little ditty below, but it’s as close as you’re going to get from me on this ghoul-infested date! And a foolish notion of Fear. From: Carlin, Francis, The Cairn of Stars, 1920, Henry Holt and Company: New York, p. 96. May all your frights be little ones! Beguiling is the word when I think upon what I can do in Photoshop. About eighteen months ago, I started working on a photograph from Wikimedia of Okunevy Island in Lake Vuoksa, near Priozersk, situated between Finland and Russia. It is a stunning image in itself, as you can see below, but I wanted to create something entirely new. Could I? Could I f**k! I let it be. Yesterday, I picked up where I had left off and deleted some of the textures I had previously included and added new ones of my own, as well as this one from Kerstin Frank. My usual tweaking not twerking and blending not bending resulted in Island Storm.